Stumbled across this koding.com site today. Koding is an online development environment with social coding aspects. Included with your free account is a personal web server Linux VM, with root SSH access. Pretty nifty idea. Programming languages naively supported are Python, Java, Perl, Node.js, Ruby, C, C++, PHP, and Go. With root access, you could probably get anything else you want running as well. "Koding is a developer community and cloud development environment where developers come together and code in the browser – with a real development server to run their code. Developers can work, collaborate, write and run apps without jumping through hoops and spending unnecessary money." 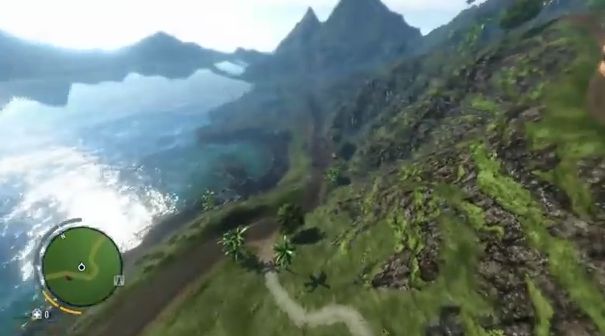 I came across this review of the Top 10 Best Graphics in Video Games 2013 [1080p HD] - YouTube and found it informative (nearly 1 million views). Chillingo has made a fun little physics puzzle game, you can play online for free. You will need an updated browser that supports HTML5, such as Firefox or IE10 to play. For a few bucks you can also buy it on the Apple/Android/Windows store and play on your phone/tablet. The game physics are similar to World of Goo. 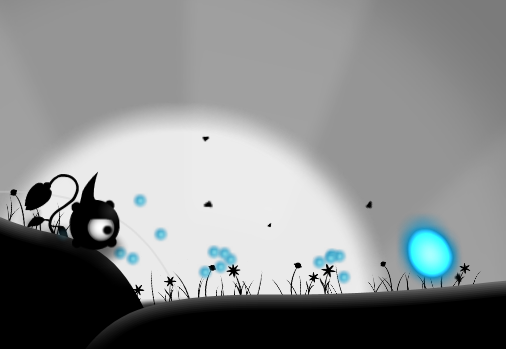 "Blurring the lines between interactive art and games, Contre Jour showcases a beautiful but haunting world shaped by the interplay of light and darkness. Utilizing intuitive touch controls and set against a poignant orchestrated score, you’ll guide a mysterious creature (named Petit) through organic and machined levels by manipulating the very environment itself. Pull, swipe, and tap gadgets such as tendrils, air geysers, and pulleys to complete clever puzzles." Intuitive touch controls let you interact with the environment in delightful and surprising ways. Sixty levels of mind-bending puzzles to explore and play. An emotional musical score by famed composer David Ari Leon adds a level of sophistication and heart to the game. Directly inspired by Antoine de Saint-Exupéry's legendary story, The Little Prince (French: Le Petit Prince). For a bit of fun trivial, Contre-jour (French for "against daylight") is a "photographic technique in which the camera is pointing directly toward a source of light, which produces backlighting of the subject and creates silhouettes and emphasizes lines and shapes." 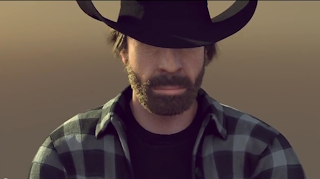 Well, Chuck Norris, once again, shows us how it's really done, in this epic parody. between two moving Volvo trucks. A popular tourist attraction, this time of year, in Utah is the Historic Temple Square lights. 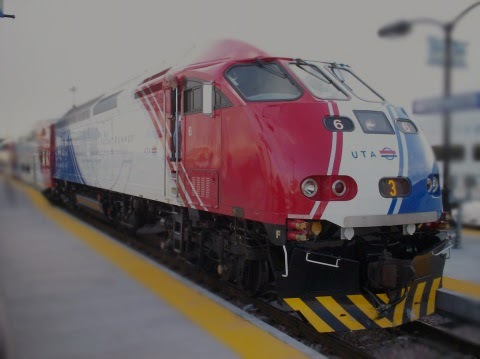 Our family has a tradition of riding the FrontRunner commuter rail to downtown Salt Lake City. Although ridding the train doubles the length of the trip, it is our kids favorite part of the trip. Note: If you are curious, the Google "Auto Awesome" photo effects are auto added to certain photos (haven't yet determined how it determines which photos qualify) when you upload them through Google Photo. If you have an Android phone with "Auto Backup" turned on, your photos will be automatically uploaded to Google Photo for you. Bitcoin may be heading to space soon. 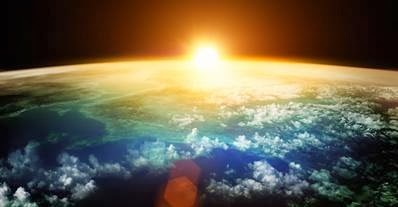 In a recent article titled Core Developer to Launch Bitcoin Node in Space, there are discussions about launching Bitcoin nodes into space. The benefits of these Bitcoin satellite nodes would be expanding the reaches of Bitcoin to remote areas that may only have satellite access, and helping prevent against attacks like the Sybil Attack. Ever have an old bank account that you forgot about? Apparently I did. 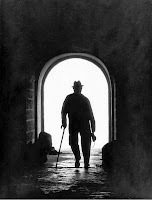 Some time after an account goes dormant, it is declared abandoned and is turned over to the state. Fortunately, the state provides a way for you to claim your "abandoned property". First, start by going to the State of Utah Unclaimed Property Division website and do a search on your self to see if you have any listed abandoned property. If you are feeling kind, you can also run a search on your friends and family. It was a kind family member who notified me of my missing property. 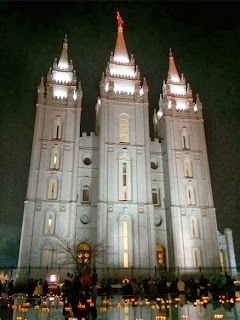 "Each year, millions of dollars in bank accounts, stock certificates, checks, insurance checks, bonds and dividends are turned over to the State of Utah because the owners cannot be located. Some of this money could belong to you! 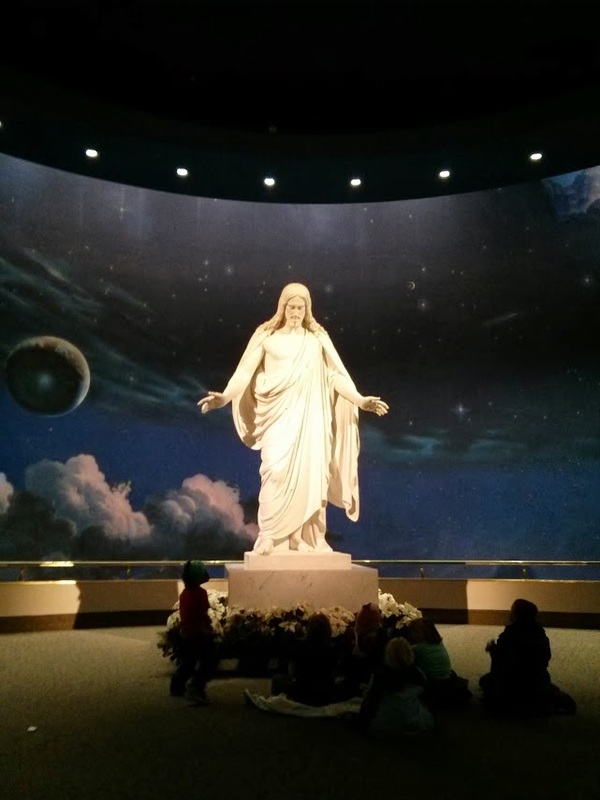 It may take only a couple minutes of your time to see if you or a family member is listed. 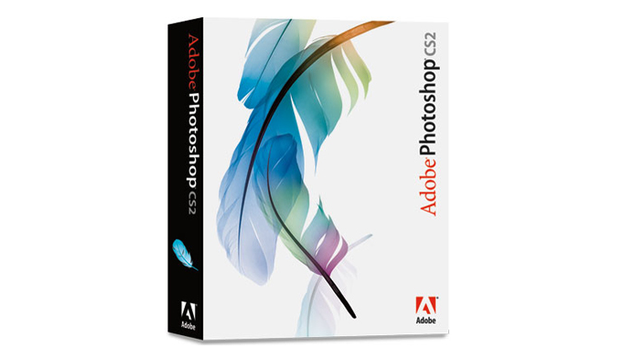 It's easy, it's free and it's yours." 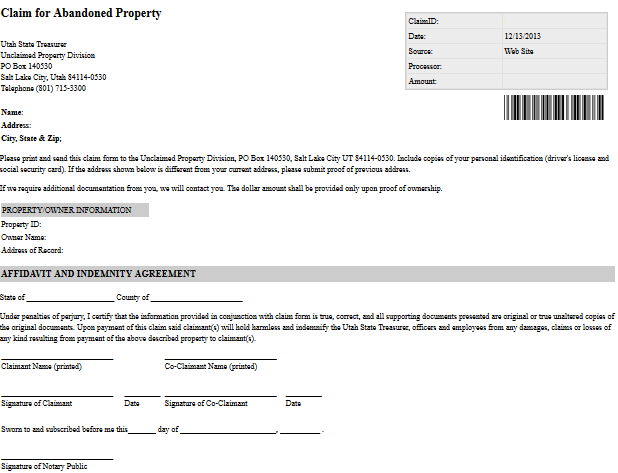 If you find property tied to your name, you claim it by filling out and submitting a form. The claiming process involves filling out and printing a form, having a Notary sign it, and finally submitting the form to the state. I walk by this pictured green "engineering" wall daily. Feeling a bit nostalgic. 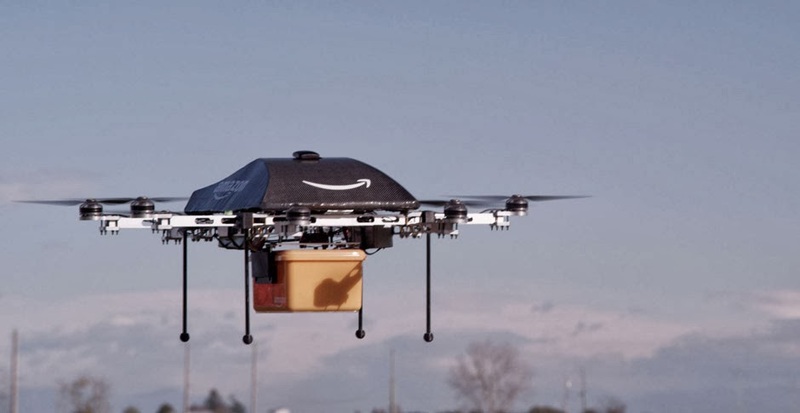 "A Utah-based tech company was recently named the fourth-fastest growing company in America. Many people may not be familiar with Fusion-io, but they deliver the data faster on all most computers." Also, through anonymous reviews on Glassdoor.com, Fusion-io has been ranked one of the top mid-sized companies to work for in 2014. Fusion-io announced our ranking this morning in a press release. 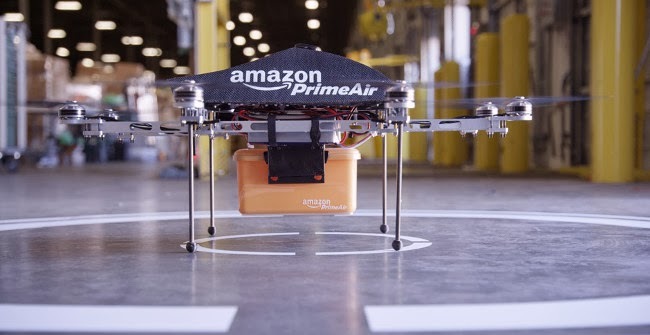 A Utah-based tech company was recently named the fourth-fastest growing company in America. 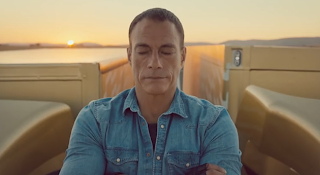 Many people may not be familiar with Fusion-io, but they deliver the data faster on all most computers. 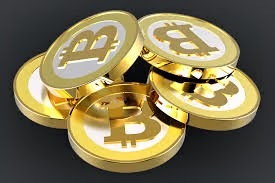 A fairly low level description as to how Bitcoins actually work. 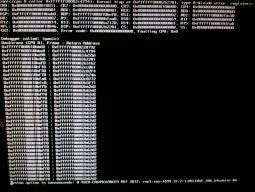 Have you ever wanted to generate a kernel panic, for kernel testing purposes? 1. From the DCUI (Direct Console User Interface), press "[F2]" and login. 2. Navigate down to "Troubleshooting Options", and press enter. 3. 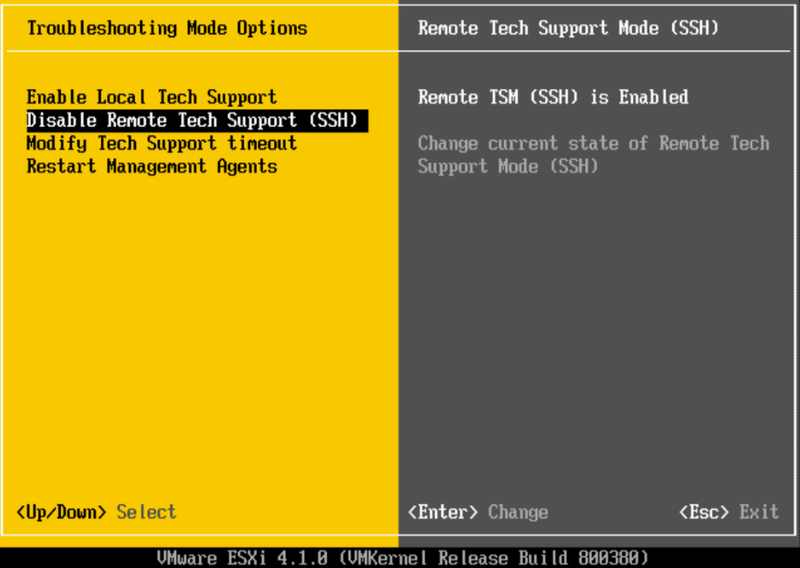 Navigate down to "Enable SSH" and press enter. 3. 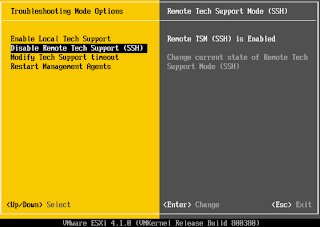 Navigate down to "Enable Remote Tech Support (SSH)" and press enter. 1. From the DCUI (Direct Console User Interface), switch to the hidden shell login screen with "[Alt]+[F1]". 2. Type in "unsupported" (the characters will not be echoed back) and press enter. Now enter in the root user's password and press enter. 1. From the terminal screen, switch to the shell login screen with "[Alt]+[F1]" and login as root. WARNING: This is for education/informational testing/development purposes only, and should not be used on a production server. 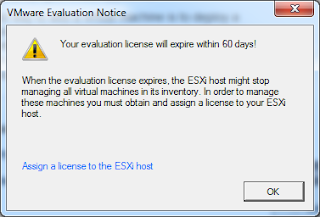 If your ESX server is connected to a vCenter server, please remove the ESX server first. Once the steps above are completed, you can add it back to the vCenter server. 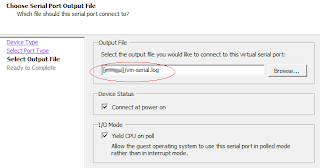 The alternative also shows a method for resetting the trial license while connected to vCenter server. 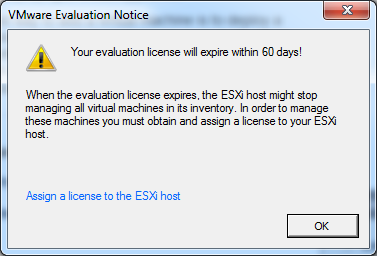 I still think removing and re-adding the ESXi server is cleaner. Note: Make sure to leave the password empty, or you will defeat this whole passwordless exercise. Next we will use a helpful tool to copy our public key to the appropriate location on the target server. The "ssh-copy-id" tool will copy the public key to ~/.ssh/authorized_keys and set the appropriate permissions for us. This can be done manually, if needed. WARNING: Make sure to include 'root@' or it will try to copy to the same user name as you are currently logged in as. 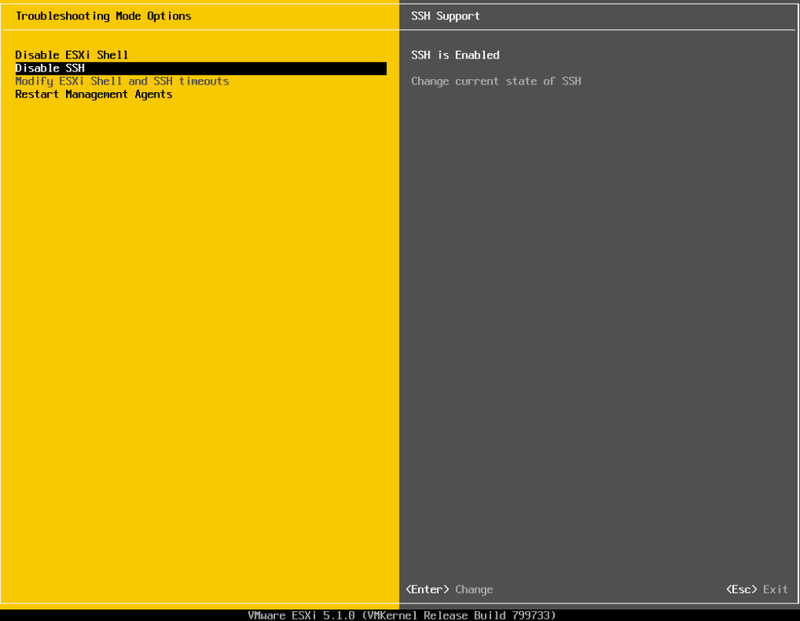 Note, each version of ESX/ESXi has a few adjustments to make it work. For Windows servers you will need to use PUTTY and PUTTYgen. Within PUTTYgen, simply click "Generate", move your mouse a lot over the blank area, and wait for the keys to be generated. The text within the "Public key for pasting into OpenSSH authorized_key file" area is the key that needs to go into the authorized_keys file on your server. Click the "Save private key" button and save this private_key.ppk file to a secure location. This is the key you will load into Putty to connect to the server. 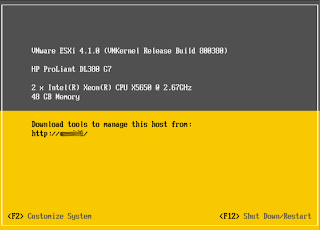 ESXi 5.x looses the keys on reboot unless you take a few extra steps. 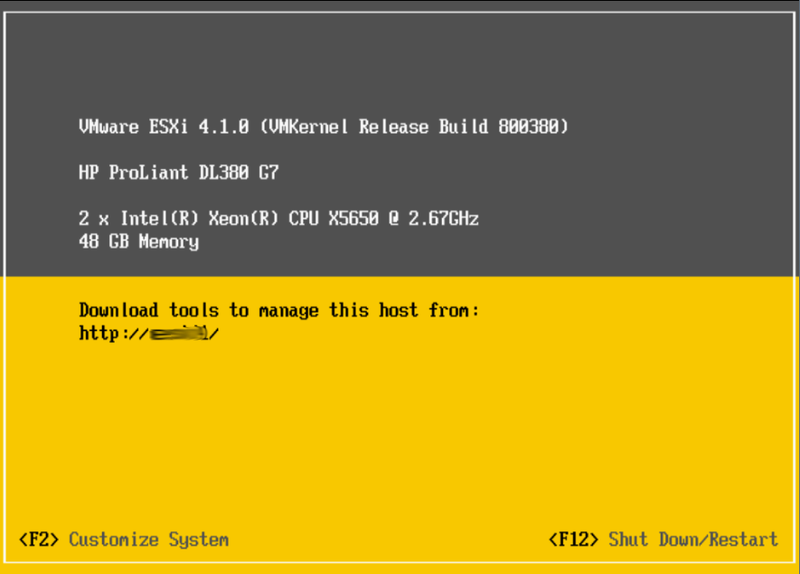 ESXi 4.x looses the keys on reboot unless you take a few extra steps. 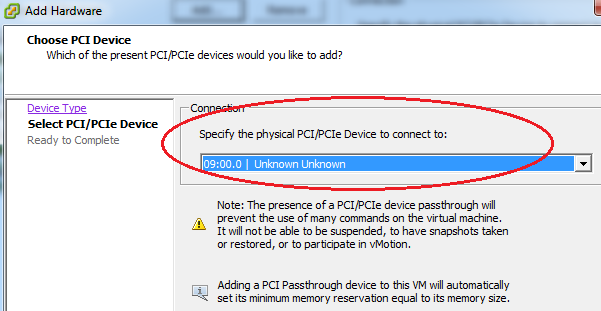 VMDirectPath I/O, aka PCI Passthrough, is a method of giving a VM direct access to a PCI device. 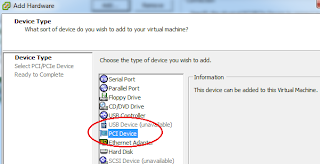 As there is direct access to the PCI device, the only setup required is to create a VM and then assign the desired PCI device to the VM, using the direction in the KB article. 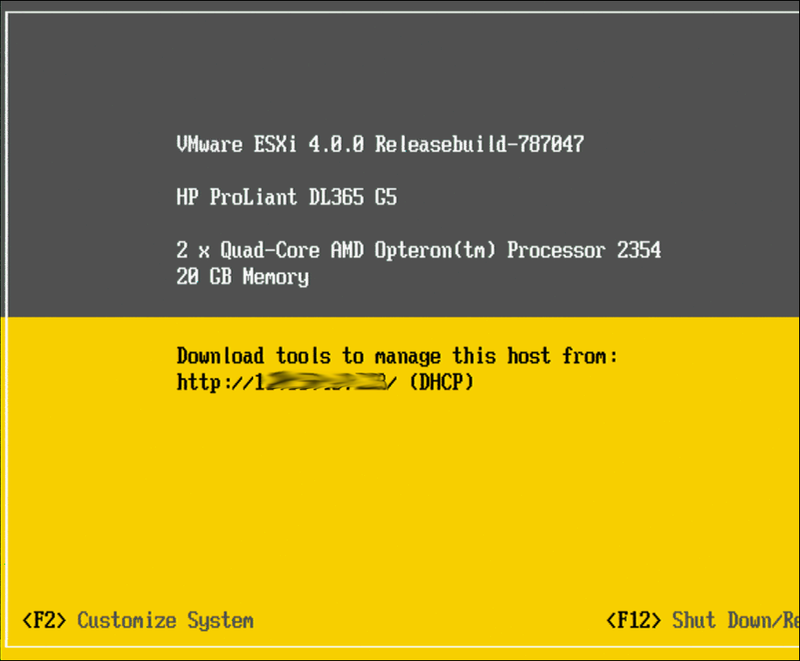 No driver need be installed on the ESX host, only within the VM's guest OS. To configure the VM follow the standard procedures for the target operating system, as though it were a physical system. The server's CPU must support and and BIOS must have enabled: "Intel® Virtualization Technology for Directed I/O (VT-d)" or "AMD I/O Virtualization Technology (IOMMU)"
The server CPU/BIOS must support Intel VT-d or AMD IOMMU. 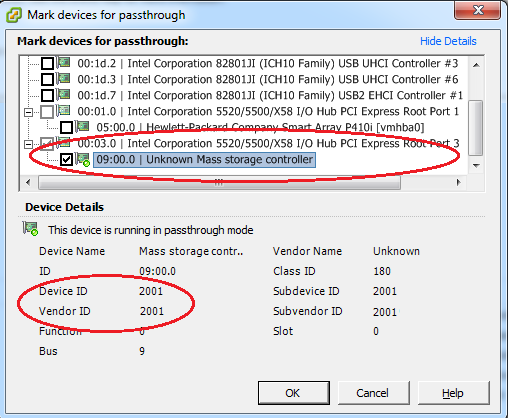 WARNING: When updating firmware through VMDirectPath, when fio-update-iodrive requests a reboot, this means a reboot of the physical hardware, not just the VM. 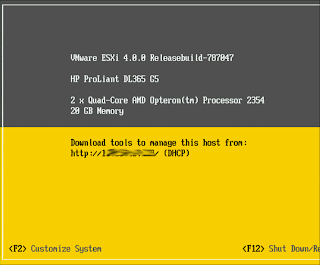 Note: These same procedures work for ESX/ESXi 4.x and ESXi 5.x. 1. 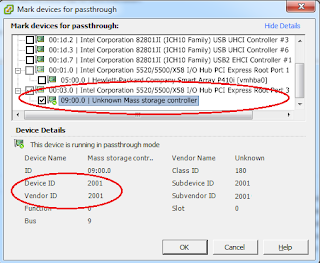 Export out PCI devices through "Advanced Configuration". The names may not be what you would recognize, so it is best to match on "Device ID" and "Vendor ID". 3. 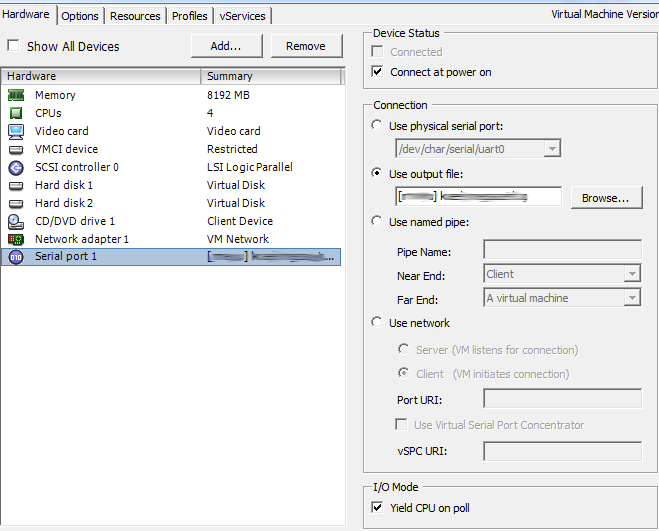 Add PCI Device to VM's configuration. 4. Set Memory Reservation. 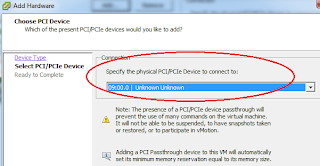 PCI Passthrough requires all allocated memory to be reserved for the VM. 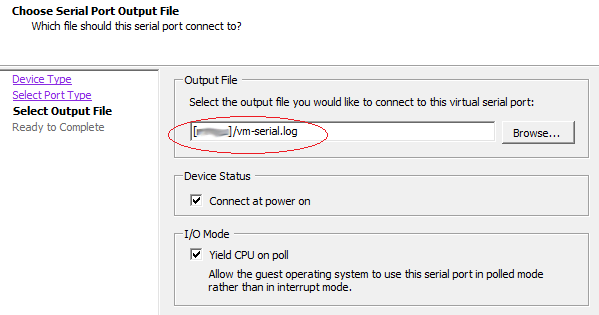 Set the VM's Memory Reservation to match the VM's Memory Allocation. Simply drag the Memory Reservation slider all the way to the right to the orange triangle. This will also need to be done anytime the memory, for the VM, is adjusted in the future. 5. 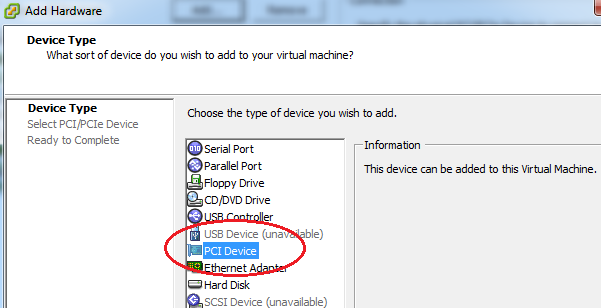 Treat device, in VM, as you would a physical server (install the OS specific driver within the target VM). 22,000 attendees this year to VMworld 2013! Summary: VMware is hell bent on removing all IT admins (Storage/Server/Network/Management) from the data center and replacing them with Virtualization Admins! There is a major shift of traffic volume in the data center from North-South (client-server) to East-West (server-server). Single datastore called “vsanDatastore” by default, can be renamed. Check out VMware Flings – free projects that are very useful! 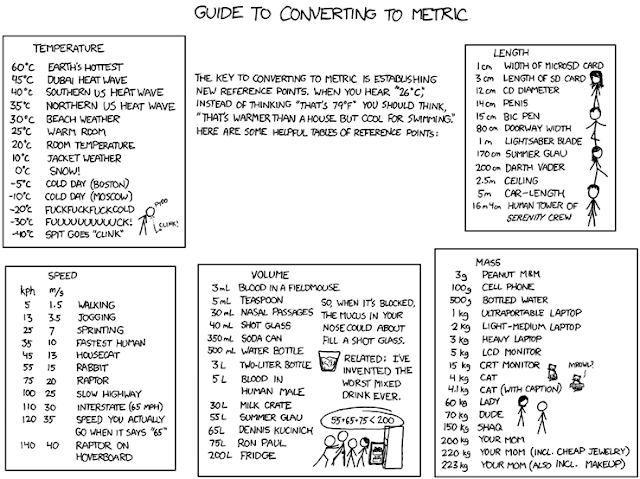 Cool stuff, might be useful for vCenter Plugin? Moves responsibility from Storage Team to virtualization team, but can they handle the extra load? 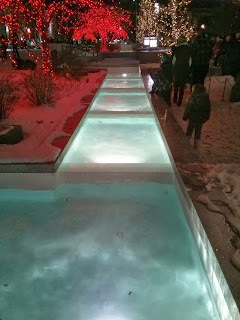 Awesome blogs, add to favorites! 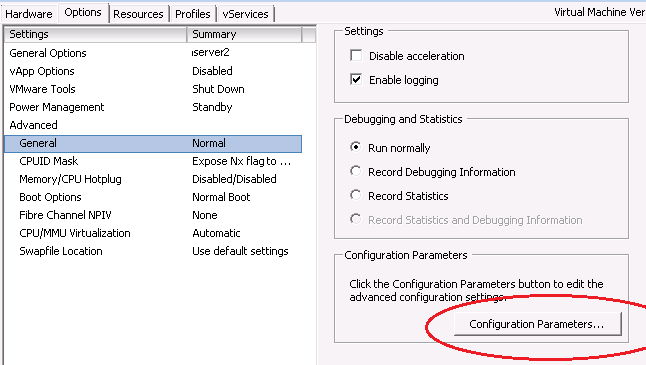 Trust VMware NUMA default settings, the experts know better. Modify at your own peril! 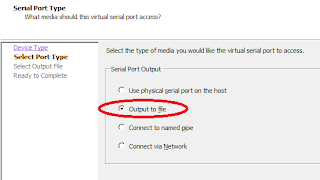 Virtual Cores only added for licensing reasons. 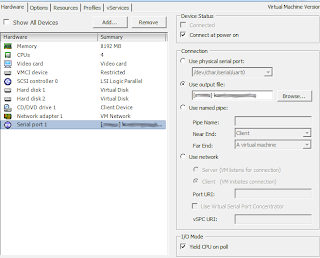 Using Virtual Sockets vs Virtual Cores makes no difference to VM. 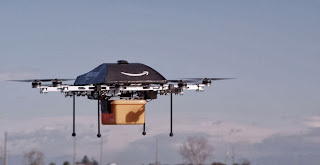 If latency sensitive – don’t over subscribe! Simple as that. VMware has 20,000 partners, and 3,000 technical partners. How to get better dev support? How to get in as inbox driver? TAM or SDK support (SLA)? vSAN Cert on Dev Center? Conference for Dev or more technical dev sessions at VMworld? Have we tried the new Test Manager that can help automate IOVP process?